Outstanding yuan loans grew 13.2% in January from a year earlier, also faster than an expected 12.5% rise and compared with an increase of 12.7% in December. 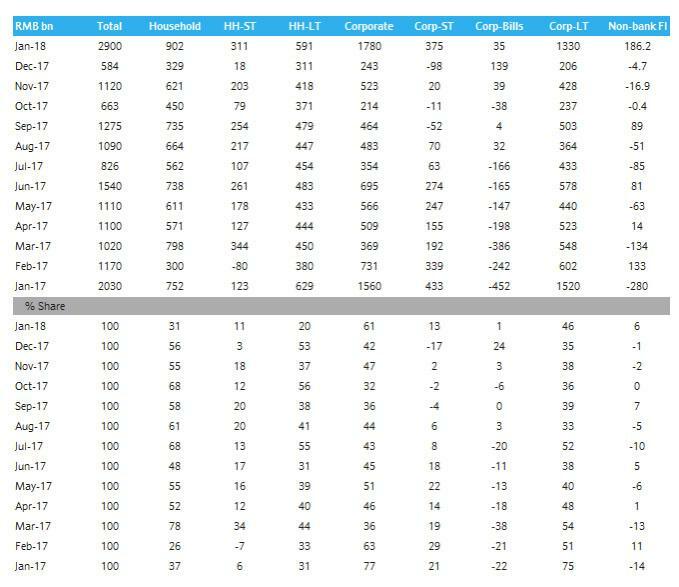 A breakdown by borrowers suggests that corporates and households have levered up, with their new credit making up 66%/29% of the new system credit (44%/23% in Dec 2017); government borrowing narrowed to 2% of new credit, due mainly to zero local government bond issuance in the month (same in Jan 2017). For corporate loans, medium-to-long-term loans increased by Rmb1.33trn, lower than the Rmb1.58trn in Jan’17, reflecting impact from tightening infrastructure projects. As discussed last month, the December new loans number was surprisingly low, and was likely due to banks slowing the loan extension as their quotas ran out, suggesting part of the December loans could have been postponed to January. ... continued into 2018, with the PBoC, CBRC, and other regulators issuing five new regulations covering bond trading, bank risk exposure, and entrusted loans within the first week of January. The CBRC further released a statement in the same month pledging to intensify its crackdown on banking misconduct, re-emphasising its priority on interbank and off-balance-sheet regulations this year. Indeed, with the contraction in off-balance-sheet lending offsetting the strong new loans, the TSF growth declined to 11.3% in January from 12.0% in December. As shown in the chart below, January TSF dropped to just CNY3060bn missing exp. 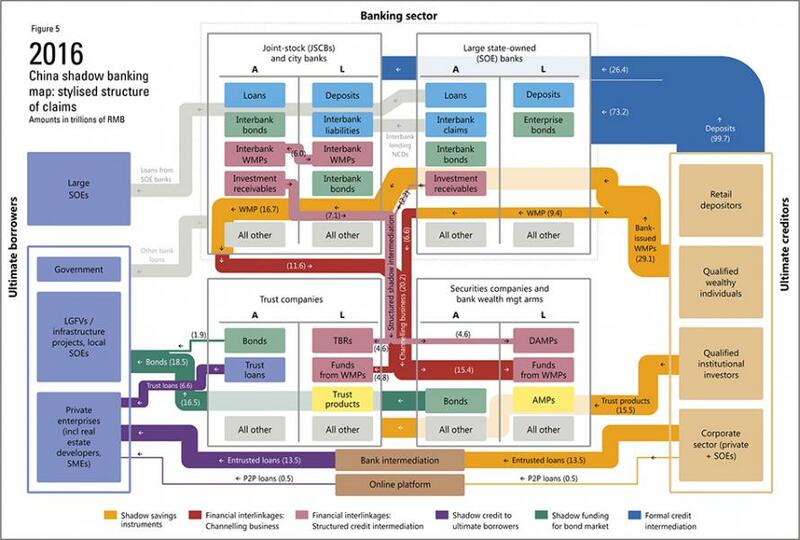 of CNY3150bn, from CNY3724bn last year, driven by a sizable contraction in off-balance-sheet lending. As a result, adjusted system credit growth of 13.1% yoy was a record-low in the past 32 months. 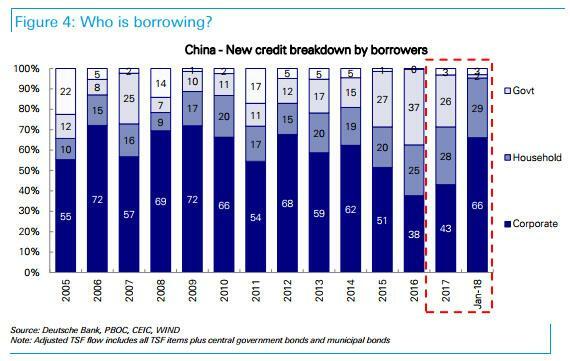 While new loans to the real economy (excluding loans to non-bank financial institutions) and corporate financing increased to CNY2690bn and CNY119bn, respectively, from CNY2313bn and CNY-58bn a year ago, they were dwarfed by the slide in off-balance-sheet lending to CNY118bn from CNY1244bn last year. After the contraction in December, the January contraction in off-balance-sheet lending was again seen across the board, in entrusted loans (CNY-71bn, a year ago: CNY314bn), trust loans (CNY46bn, a year ago: CNY317bn), and undiscounted bank acceptance bills (CNY144bn, a year ago: CNY613bn). 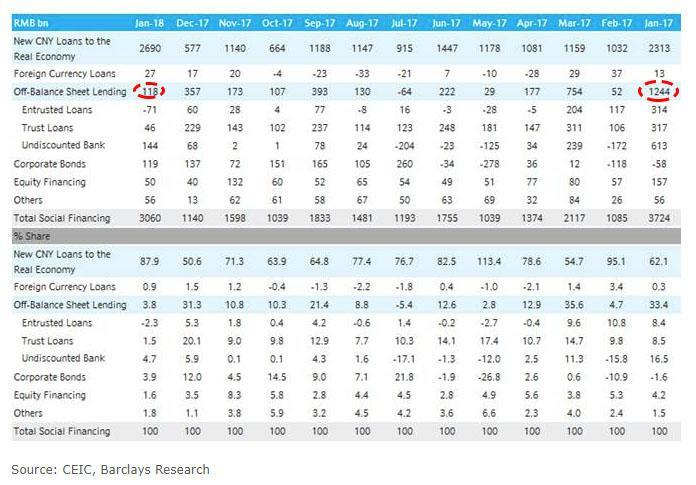 The Barclays Alternative Credit Aggregate, which includes non-traditional sources of shadow credit and government bonds not captured by TSF, slowed to c.12.3% from 13.1% previously. “Banks hope to lend early to get early returns... private investment and manufacturing investment are picking up due to firmer global demand (and) household loans could be boosted by property demand,” said Nie Wen, economist at Hwabao Trust in Shanghai. "This indicates the economy may slow in the first half but any slowdown won’t be sharp..."
Despite the crackdown on off-balance sheet debt, China authorities are proceeding cautiously and keeping liquidity broadly supportive to avoid any sharp drag on the world’s second-largest economy or excessive financial market volatility. Since the start of 2017, Chinese regulators have announced a slew of steps to coax financial institutions to reduce riskier activity and leverage - but not too much -targeting everything from interbank lending levels to bond trading, negotiable certificates of deposit and entrusted loans. In addition, the PBOC has been nudging up money market interest rates, most recently in December, but rates have also been slowly creeping higher on their own as regulators look set to persist with the current “de-risking” campaign much longer than policy crackdowns in the past. Those efforts appear to be bearing fruit. The outstanding amount of banking wealth management products (WMPs) grew just 1.7 percent last year, compared with a near 24 percent rise in 2016. Many of these products comprised the backbone of the unregulated, and extremely risky, shadow banking sector. Broad M2 rebounded to 8.6% in January from a year earlier, up from a record low 8.2% in December, and also above the 8.4% expected. Meanwhile, despite the clear inflationary burst provided by the record loan creation, other data last week had painted a somewhat mixed picture of the economy at the start of the year, with inflationary pressures easing - possibly pointing to softening activity - but better-than-expected import and export growth. Taken together, the stronger credit and trade data would appear to still support the consensus view that China will see only a modest pullback in GDP growth to around 6.5% this year, after a forecast-beating 6.9 percent in 2017. 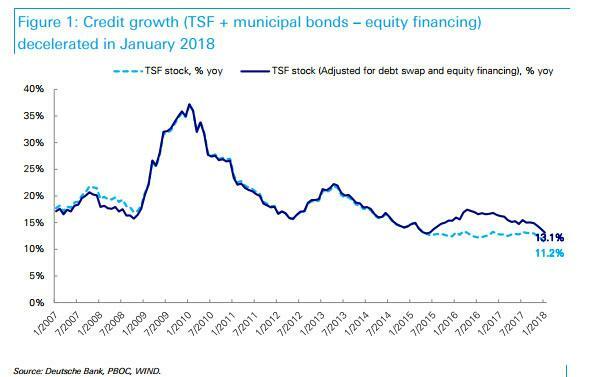 Meanwhile, analysts expect Chinese authorities to to step up their shadow banking crackdown efforts this year, focusing on local government debt, rising corporate and household debt levels and dealing with “zombie” companies. On Monday, the state planner issued new rules for companies which are planning to issue bonds to put more pressure on debt-laden local governments to get their finances in order. But analysts say more still needs to be done on structural reforms to rein in ballooning corporate debt, which has reached levels that the IMF and others have warned sharply raises the risks of a financial crisis.